When roads wash out or communication lines are cut, first responders need swift, cost-effective, and safe ways to meet people’s needs. Unmanned aircraft systems (UAS) are emerging as a versatile tool in the first responder arsenal. The University of Maryland UAS Test Site, along with partners from the public and private sector, are testing software and hardware that can help first responders communicate across multiple unmanned aerial vehicles in numerous locations in real time. 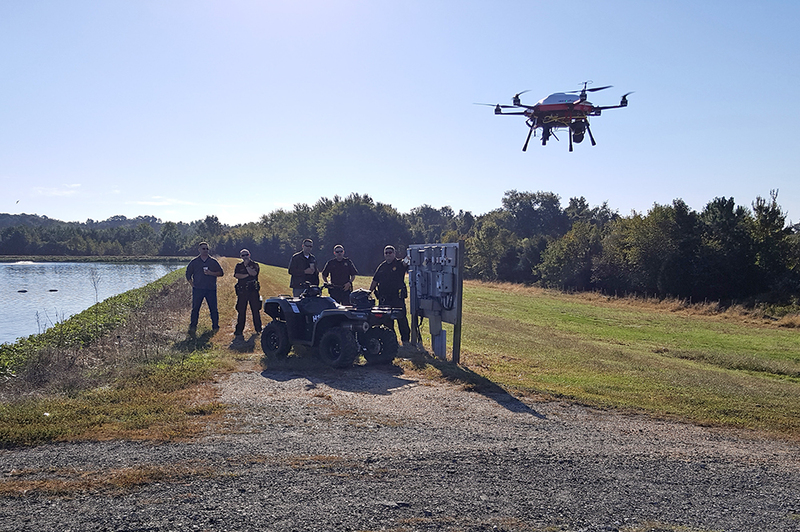 On October 13, 2016, at Cobb Island, Md., and Cambridge, Md., engineers from the UAS Test Site along with Charles County Emergency Medical Services (EMS) cooperated on a demonstration that tested the ANRA Technologies solution. ANRA is a cloud-based drone operation platform that allows real time flight management, flight tracking, planning, and and sensor data management and dissemination enabling multiple UAS operators to plan and remotely share video, pictures, and tracks. In another demonstration, a UAS equipped with a radiation sensor demonstrated the usefulness of using unmanned aircraft to monitor radiation levels in the event of a leak from a nuclear power plant. The Ace RAD unmanned aircraft was operated by a pilot from UAV Solutions from the UMD Shore Medical Center at Dorchester in Cambridge, Md. Charles County first responders viewed live video feed and radiation readings from the Ace RAD from more than 45 miles away. This demonstration highlights new ways to apply UAS technologies and helps us better understand the challenges of establishing communications in a post-disaster environment. This is not the UAS Test Site’s first collaboration with the first responder community. In August, the UAS Test Site and the UMD Shore Regional Health conducted the state’s first civil unmanned aircraft delivery of medical cargo to demonstrate the key role that UAS can play in emergency situations. Participating in the October 13 demonstrations were ANRA Technologies, UAV Solutions, Charles County EMS, Charles County Sheriff, University of Maryland Shore Regional Health. The Calvert County EMS and Maryland Institute for Emergency Medical Services Systems provided observers for the exercise. The ability to communicate in real time across platforms enhances first responder UAS efforts.